"Moderate" delays on the Riverside Line due to a trolley that met a sudden demise at Newton Centre, the T reports. Jennie shows us the tree near Newton Centre responsible for the dreaded "severe" delays on the Riverside Line. A "power problem" between Newton Centre and Chestnut Hill means "moderate" delays, the T advises. Train died at chestnut hill. Second train just came and is pushing the dead train. It's been 30 min so far. This photo, taped by the cash registers at Rosenfeld's in Newton Centre, never fails to crack us up. 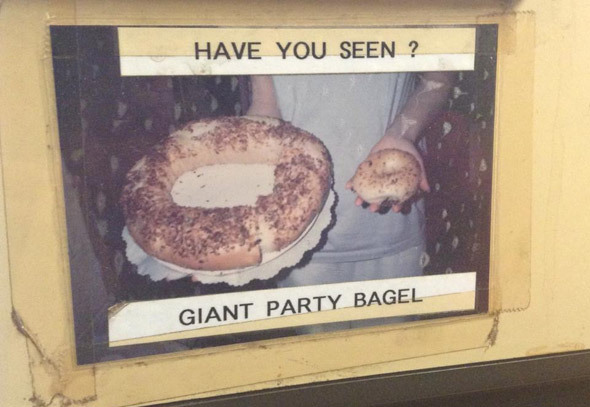 Is Giant Party Bagel missing, the victim of some horrible bagelnapping? Or is it just boasting: Look at this, look at it! Giant Party Bagel doesn't mess around, it takes no prisoners and it's large and in charge. But imagine the tub of lox spread that goes with it. Lorianne Disabato reports on the black Volga sedan parked in the lot in the middle of Newton Centre today. Best place for pizza around Newton Centre? Chris Rich spotted this Butterball on a Newton Centre lawn today. Copyright Chris Rich. Posted in the Universal Hub pool on Flickr. The Globe reports the alleged butterfingers was packing a loaded gun on an outbound trolley just before Newton Centre; a rider dropped a dime and police arrested him and three pals. When might be a bad time for an overhead wire to fall onto the Riverside Line? If you guessed Friday afternoon rush hour, you win! Unlike the people now stuck waiting for shuttle buses to get them around the downed wire at Newton Centre, who lose. 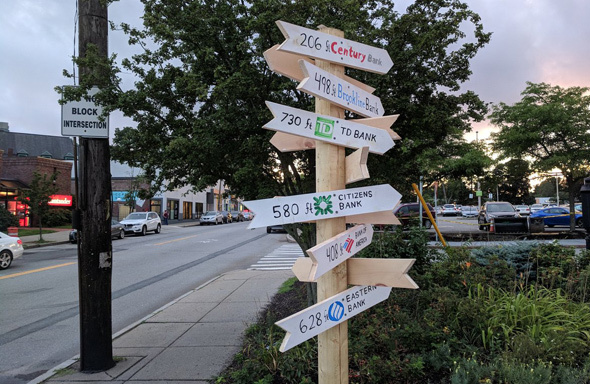 Paul Levy reports on the tsouris he is having thanks to a Bank of America ATM in Newton Centre that ate both his ATM card and the checks he was attempting to deposit. He follows up with a post on his travails with a Bank of America rep who contacted him via Twitter. Via The Missus, who writes people go to Starbucks for the ambiance, not the awful coffee and stale pastry. 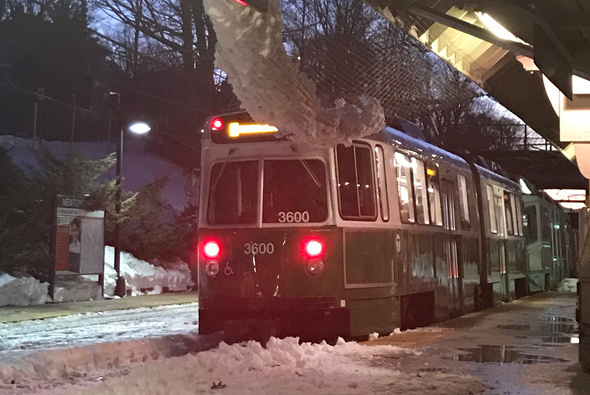 The MBTA says it has to shut Langley Road in Newton Centre for six months to repair a bridge over the Riverside Line - and will likely have to shut Riverside service for five weekends as part of the work (so get ready for buses, folks). Greg Reibman is all for repairing decaying bridges, but he wonders why the T couldn't have coordinated the work with this past summer's Riverside shutdown.